Get the most from your machine using Inbuilt & Freehand Stitches Here is all the help you will need to make your sewing machine's embroidery functions work for you. 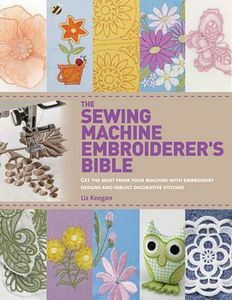 Includes details about the types & formats of available designs, and how to get them off the internet and on your machine, stabilizing fabric, types of needles & thread to use for best results. Also provides guidance for making use of the built-in embroidery stitches that modern sewing machines offer, but are forgotten about and underused. Comprehensive section covers editing, saving & organizing, & transferring & downloading designs from PC, & Internet to your sewing machine. 128 pgs paperback. CT11003 Fun Stitch Studio A Kid's Guide to Sewing Book, 16 Projects, 144 Pages. Art to Heart 8177A Angels Among Us Sewing Pattern Project Idea Book, variety of quilts, a table topper, bags, tea towels, aprons, pillows and more.